Guesting – What is a Progressive School? 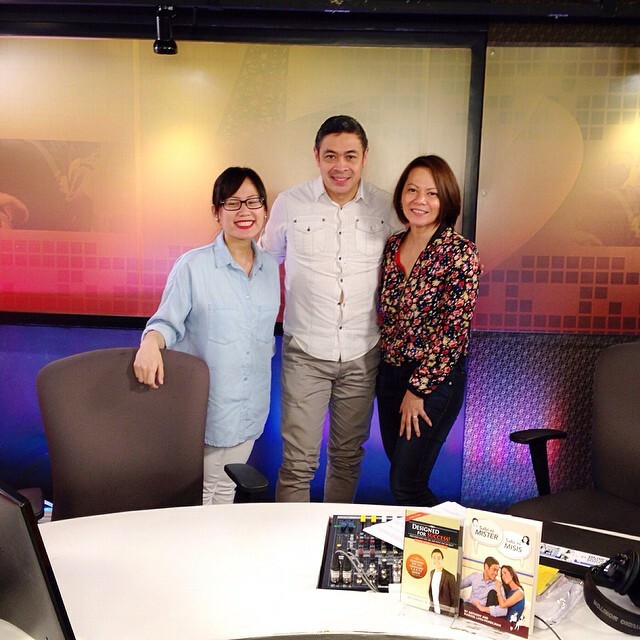 At my monthly guesting in Anthony Pangilinan’s Magbago Tayo, last Saturday, I invited Teacher Tanya Velasco of GuruFirm and author of the blog Chronicles of a Teacher Mom. She specializes in Infants and Toddlers and is also a Family Life and Child Development Specialist. We discussed how to plan a child’s environment (space and time) at home, based on how we do it in the classroom. 1. Map the space in specific and functional areas. We decentralize our classroom into different learning areas: a rest area, play area, activity area, reading area, etc. You can demarcate each space with furniture like a shelf or table, a mat with a distinct color or with a picture on what that area is. Mapping your child’s space in areas will develop skills like: sorting, visual-spacing, and categorizing. He will also learn how to clean up independently because he knows where everything should go after using them. 2. Separate the quiet from the active space. Downtime is important in your child’s schedule so he needs a quiet place for activities like resting or reading. Current studies show that even adults are encouraged not to bring in work in the bedroom to improve sleep. In the classroom, the rest area is far from the manipulatives or block area. The rest area can double as the reading area, though, because they are both quiet activities. During the show last Saturday, one listener asked what if they live in a studio? You can still do it. Teacher Tanya had a great suggestion that an area can double as a play area by rolling out a mat to cue your child that it’s play time. Then when he needs to sleep already, the mat can be rolled back and tucked away for the same area to be the sleeping area. Now let’s plan the temporal environment or your child’s TIME. Free Play – a time when your child can explore anything he’s interested in. This is an important part of his schedule so you can observe what his favorite activities are. Do you want to totally eliminate the sentence “I’m bored!” from his vocabulary? Well, having free play strengthens his creativity in entertaining himself which sadly have been replaced by gadgets these days. Circle Time – It’s a time for the members of the family to converse or bond! During circle time in the classroom, the teacher calls the students over to huddle and discuss what will happen in class. At home, you should carve time where you have intimate talks with your kids, regardless of age and preferably sans gadgets! Activity Time – There are a lot of extra-curricular and curricular activities available for your child.. There’s sports, music, reading, writing, cooking, etc! Unfortunately, we tend to overschedule our child’s day but filling it with activities that your child may not be interested in. Observe his interests and talk to him on the activities that you will put on the schedule. If your child is too young, choose 1-2 activities from different domains like sports and cooking, art and ballet, etc. Try to see if she won’t be too tired for the classes and choose a time when she’s most awake like in the mornings. For older kids, zone in on their interests because the activities available for them can be pricey. If he’s enrolling in guitar class, purchase an inexpensive guitar first because he may switch instruments or drop his interest altogether. Play Time – the most underrated block of time is play time. This is different from Rest Time because if you haven’t seen a child play, it is not restful! 2. Make use of Transitions. When moving from one routine to another, use transitions or prep them to move to the next routine. Teacher Tanya’s toddler Ellie knows when it’s time to pack away her toys and move to her rest time, because Teacher Tanya counts to 10 or sings a song that prompts Ellie. Young children find comfort in knowing what will happen next. The only reason a crying students stops crying from separation anxiety in school is because the routines and transitions are done consistently. It’s interesting that while discussing this topic, we were able to also give tips to the parents as well! Planning your own SPACE and TIME as parents or teachers, is not so different from the points we talked about. For more of Teacher Tina’s Parenting Tips, tune in to Magbago Tayo every Saturday at 8 am, Channel 59 and 92.3FM Radyo Singko. Mommy Mundo, the go-to resource portal for active, modern moms in the Philippines, presents the first talk in its MomSchool series on March 21, 2015 (9:00 am – 12:00 nn) at The Forum, Fully Booked, Bonifacio High Street, Taguig City. I’m so excited to be part of it as I give tips on How to Find a School, Comparing Traditional and Progressive Schools and How to be a Partner to your Child’s Teacher. 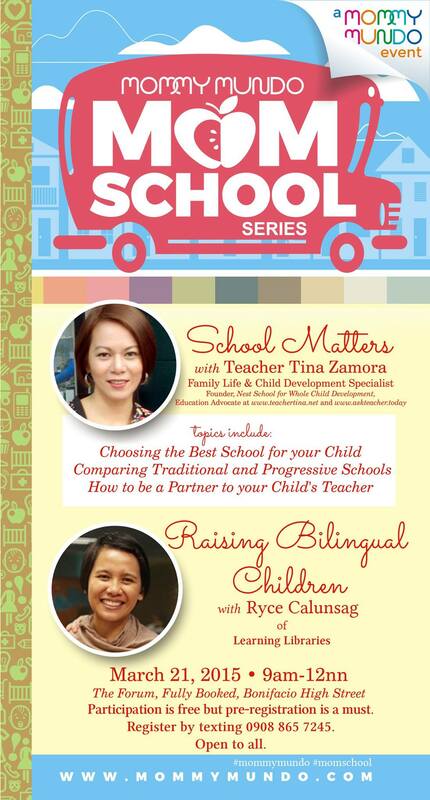 With me will be Ryce Calunsag of Learning Libraries who will be discussing How to Raise a Bilingual Child. Participation is FREE! Please text 0908-865-7245 to register. Hope to see all the followers of this blog so I can answer all your questions in person! My good friend Maricel Laxa-Pangilinan debuts in radio tomorrow, April 21, in a DZMM 630 TeleRadyo show called “Kapamilya Konek”. This show will tackle every issue regarding family life as Maricel is known to be an advocate in good parenting. Not only that! Like me, she is also a Master of Family Life Child Development graduate from the University of the Philippines. She has invited me to come on board every Sunday at 5:00 pm. 630 in your AM dial and Teleradyo in your local and cable channels. Do listen up and savor the different family life issues that we bring to the radio show. You can also like the show’s Facebook page at http://www.facebook.com/kapamilyakonek and join our numerous calls for pictures and questions. Hope to hear from you as you hear from us! Thanks Mommy Pages for featuring my article “5 Things to Ask when Scouting for a School”! Mommy Pages is the ultimate directory for moms in the Philippines and what’s great is… it’s free! Grab a copy of this wonderful guide of everything Mom by clicking on their site. Teaching children R-E-S-P-E-C-T .. and a contest! I am again the guest of Sonshine Radio DZAR 1026 AM on Thursday, August 20, from 10-11 am. The topic is Teaching Children Respect. Can you help me out? Submit your answer as a comment to this post. Don’t forget to put your name and e-mail address. I know there’s Online Live Streaming of the show. I’ll update this post once I find out the site. Live Streaming for the show is at http://www.sonshinetvradyo.com/ or you can tune in DZAR 1026. A break from your regularly featured programming..